by: Thomas WatsonIssues: November / December 2015. Tags: IBJ Insights and Leadership. Categories: IBJ Insights. It was not your typical Hallmark moment. After losing her beloved sister Miriam to kidney failure in 1993, Eva Kor spent hours in a Hallmark store, frantically trying to find the right card to thank a doctor. It was an impossible task, right from the start. After all, while the doctor in question did help honour the memory of Kor’s sister, he didn’t even try to do anything whatsoever to make Miriam’s life better when given the chance decades ago. If fact, he contributed to the absolute destruction of her childhood. While pondering this question later, Kor – who in 1984 founded an organization with her sister called CANDLES (an acronym for Children of Auschwitz Nazi Deadly Lab Experiments Survivors) to help Mengele twins collectively deal with the past – had an epiphany. Forgiveness, she realized, is how you thank a Nazi, at least if you are inclined to forgive people who do the worst things imaginable. And as far as Kor is concerned, everybody should be so inclined. Why? Simple. After forgiving her first Nazi, Kor never looked back, at least not in the same way. Painful memories remain to this day, but they now exist in a happy person (Kor is perhaps the jolliest person I have ever met as a journalist). Simply put, the 81-year-old’s philosophy is to live, let live and forgive anyone who doesn’t do the same, especially if they cause you pain and suffering. For obvious reasons, not everyone agrees with Kor’s philosophy. But she is on a mission and critics do not slow it down. Kor has forgiven Mengele, not to mention the haters responsible for the 1993 firebombing of the CANDLES Holocaust Museum and Education Center in Indiana, where Kor now lives with her husband, another Holocaust survivor. More recently, she caused a public stir in the northern German city of Lueneburg, where in mid-2015 she forgave former SS officer Oskar Groening during a break in the 93-year-old’s trial for working as a clerk at Auschwitz while over one million people, mostly European Jews, were killed between 1940 and 1945. 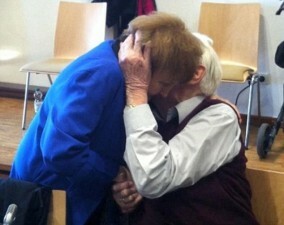 The so-called Bookkeeper of Auschwitz was so overwhelmed by the gesture that he fainted before giving Kor a kiss that was tweeted around the world, creating a mixture of hope and outrage. “Some called me a traitor,” Kor says, “but they don’t understand forgiveness.” For the record, Kor doesn’t see forgiveness as a means to make bad people feel better, although she admits to being surprised by her ability to like what she calls reluctant Nazis. As she sees it, forgiveness is for victims, who have the right to be happy, and that requires getting out from under the daily burden of pain and anger. In other words, forgiveness empowers victims to heal because it gives them power over the individuals who chained them to misery. Kor not only practices what she preaches, she preaches a lot, and not just to Holocaust victims. This year alone, she has delivered over 180 lectures on forgiveness because she firmly believes everyone can benefit from forgiving offences big and small. Forgiveness, she argues, delivers internal peace by clearing the mind of hate — which can make people more content and productive in both their personal and professional lives. And that brings us to her Ivey visit, which was sponsored by the Ian O. Ihnatowycz Institute for Leadership as part of its ongoing commitment to encouraging and enabling business students to develop leadership character. More on that visit later. First, to really understand Kor’s philosophy, we need to go back to a time that not many people today can really comprehend. In late 1943, Kor’s family tried to flee their once-welcoming community, but they were caught by a group of Hitler Youth. On January 31, 1944, Eva and her twin turned 10 while her family was under observation for being Jewish. There was no birthday celebration. Kor recalls feeling anxious, but relatively safe, until police arrived with orders to move her family to a transportation centre. After being relocated to a ghetto in Transylvania, Kor’s family was told to expect to live out the war in a Hungarian labour camp. But after spending a few days crammed into cattle cars with thousands of other Jews, it became clear that the real destination was not in Hungary. Immediately upon arrival at Auschwitz, Eva and Miriam were spotted on the separation platform by SS guards with orders to collect twins for use in Nazi medical labs. Their mother frantically asked if being a twin was “a good thing.” A soldier coldly replied “yes” as he dragged her two screaming 10-year-old girls away. That is Kor’s last memory of her parents. To help maintain the will to live, Kor volunteered for kitchen duties, which allowed her to steal the odd potato to share with her sister. But it was her determination to beat the Nazis that kept the two girls alive. After being subjected to a high-risk experiment, Kor ended up in an infirmary with other potentially terminal twins, who were not given food or water because that was considered a waste of resources. Mengele himself pronounced Kor soon-to-be-dead while cheerfully doing his rounds. But she refused to die because she knew that the Nazis conducted comparative autopsies on twins, and so death for one twin meant execution for the other. Kor spent two weeks fighting a fever expected to kill her. Every night, she dragged her starved and dehydrated body, an inch at a time across filthy, rough cement floors to a faucet in another room where she could secretly steal a drink. After hearing of Eva’s ordeal through the camp grapevine, Miriam arranged to sneak her some bread. That led to other donations of food. Kor recovered, but her survival put both twins back in the rotation for experiments. And Miriam was soon sick from the shots that stunted the growth of her kidneys. Kor stopped being thankful after the Nazis fled for good, when she had a surreal experience that blackened her soul. Armed with an empty bottle, she and two other twins had set out in the cold to fetch water from the frozen Vistula River. While the group contemplated how to break the ice, Eva was paralyzed with bewilderment after spotting another girl about her age on the other side of the river. The girl looking back didn’t look like a bug-infested skeleton. She was healthy and clean, with nice clothes and braided hair. And on her back was a school bag, which blew Eva’s mind. I really enjoyed this article as it is living proof of the liberation that forgiveness brings. We often have difficulty foregiving people for minor offenses. Kor is the Mother Teresa of Forgiveness. Often in my field of work (Sophrologist, Complimentary Therapist and Louise Hay Practitioner) one of the key concepts I use with my clients is to be grateful for whatever mishap has come upon them to bring them into a state of unwellness. It is this practice that ulitmately brings them to the forgiveness that is neceassary for them to be healthy again. Forgiveness is the key to both physical, mental, emotional and spiritual liberation … and ultimately happiness. It is not easy though. The Tranformational Leadership program at IVEY will hopefully help reshape the business environment of the future. I beleive it is the only way forward, if we want to sustain the human race. Thank you for this important message regarding the need for and the grace and power of forgiveness! “God is love”. Love forgives. Abundant blessings, in the Mercy and Love of God!